The kids in the third grade at Bailey Elementary are so hard to handle that all of their teachers have quit. But their new teacher, Mrs. Jeepers, is different to say the least. She's just moved from the Transylvanian Alps and she seems to have some strange powers that help her deal with these mischief-makers. Her methods may be a little unconventional, but, then again, Mrs. Jeepers may be just what the Bailey School kids need. 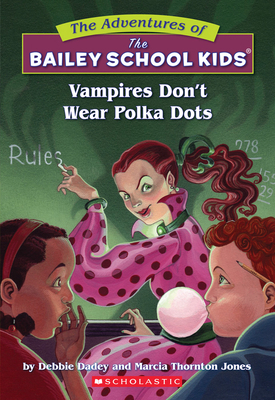 Debbie Dadey is the bestselling co-author of THE ADVENTURES OF THE BAILEY SCHOOL KIDS series, along with writing partner Marcia Thornton Jones. Debbie has also written many books of her own, including the SWAMP MONSTER IN THIRD GRADE series and THE WORST NAME IN THIRD GRADE. She lives and writes in Fort Collins, Colorado, with her family. Marcia Thornton Jones is co-author of the bestselling THE ADVENTURES OF THE BAILEY SCHOOL KIDS series, along with single titles like CHAMP. She has been writing for Scholastic for almost twenty years! Marcia lives and writes in Lexington, Kentucky, with her husband and their two cats.